As autumn presses on, we begin our transformation to the winter season of the park. While you enjoy the temperate fall weather, leaves falling from the trees, and seasonal favorites like mums, you might pause to bid farewell to several things that close as we prepare to bring back the ice rink and the Holiday Shops. Today is the final day for the lawn. Soak up those rays, grass side for the final time this year. 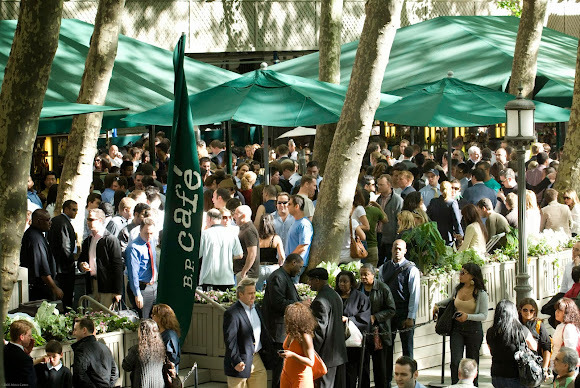 The chilly air also heralds the end of outdoor drinking season at the Bryant Park Cafe, which will be open through this Saturday, October 19. The Bryant Park Grill is still offering up dining al fresco in the restaurants enclosed garden, and the Southwest Porch will be open year round with heaters to keep you warm. Toss around Kubb or putt for the last time this week at the park's putting green and kubb pitch. The Green will be open through Friday, October 18, after which it will close to allow for Holiday Shops load-in. Not to worry as you seek out your fall entertainment. Le Carrousel is open 12 months a year, with a few exciting parties coming your way including the annual Halloween celebration Tricks and Treats. The Games Area will be open at 40th Street Plaza at least through the end of October, and for the ping pong lovers, The Tables will be open through Thanksgiving.